I’m in the mood for some Handelian opera seria, let’s imbibe some this week, shall we? The young German-born (Halle) Handel travelled to Italy, where he soaked up the latest innovations developed by composers like Alessandro Scarlatti. These included a larger, more varied orchestra, as well as an extended form of aria, which became the building block for a style which would dominate the genre for the best part of a hundred years. No, ‘opera seria’ doesn’t mean ‘serious opera’, but opera based on the da capo aria with its A-B-A form. This tripartite form had the first melody followed by a second melody of contrasting mood and pace, with a repeat of the first melody, embellished with ornaments by the singer. Handel came to London in 1710, and became a naturalised British subject in 1727, producing an astonishing succession of opera serias. Italian opera became all the rage. This vogue was satirised by John Gay’s The Beggar’s Opera, with music culled from popular ballads and folk tunes. It didn’t help that opera remained an Italian import for the upper class, in a foreign language. In later years, it would go out of fashion, and Handel would turn his hand to the oratorio genre. Handel’s vocal writing is a perfect showcase for the technical skill of the singer. Mozart is another example. You need the appoggio (‘support’…use that term with caution…) with the coordinated onset and release, the basis of technical ability. Sostenuto (a smooth legato, squeezed out of a toothpaste tube is a common metaphor) and agility (check that coloratura out) are both required in the da capo aria, usually exploited for their contrasting characters. You can’t do one without being able to do the other anyway. Register unification, with even gradation through the passaggio, retaining resonance through increased appoggio and vowel modification (aggiustamento) is required, because Handel presumes that you can do that perfectly already. The hardest of them all, messa di voce and dynamic control can produce some thrilling effects. So yes, singing is easy. Not. Many of those roles Handel wrote were for castrati; the resulting hormonal development from their operations gave them large pigeon chests (vast intake of breath) and a hauntingly beautiful, other-worldly timbre. 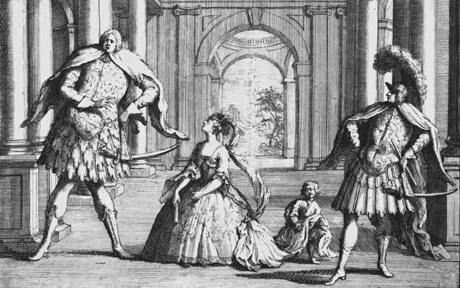 Today, these roles are taken by either female mezzo-sopranos or male countertenors (falsetto), who can only approximate the freakish feats of the castrati. Right, overture. Always a safe bet to start here. It’s in the three movement structure of an Italian sinfonia, and yet the middle section is fast and fugal, which you’d expect of a French overture. Cara Sposa. Amante Cara, Dove Sei? This is one of the opera’s most famous arias, although arguably, everyone knows Lascia ch’io pianga. Listen to when the bass comes in. Ahhh. Just endless lines of legato from the singer. Musical turn on. Mio Cor, Che Mi Sai Dir? Lascia Ch’Io Pianga Oh hello, it’s about time this tune popped up. You also hear this in Almira, or the oratorio Il trionfo del tempo e del disinganno. Here is Magdalena Kozena with Andrea Marcon and Venice Baroque Orchestra. The sheer simplicity, and yet how moving it is. The warmth in those first two notes, no words, and yet they express emotions. Vo’ Far Guerra, E Vincer Voglio Harpsichord solo, yaay! Or La Tromba In Suon Festante Check out the brilliant scoring with 4 trumpets. Lastly, a word on Glyndebourne’s production, directed by Robert Carsen. Whilst the background to the plot is the first Crusade, Carsen presents it as the heroic fantasies of a bullied schoolboy. I found it fascinating that the final battle scene was presented as a football game. What did you think?